This would be a good start. Or maybe here. Irresponsible journalism at its finest. But by the time the truth came out it was far too late. To even insinuate that two NBA players-teammates at that-actually drew guns on each other in their own locker room requires more fact checking and due diligence than talking to ‘Pookie’. Bookie. Whoever. It opens the floodgates of vitriol for any columnist, talking head, blogger or internet commenter to bemoan the state of professional sports. It’s a completely unprecedented act that would forever serve as the epitome of athletes gone awry and reflective of a societal ill at the very root of the NBA’s image problem. Not to mention African Americans as a whole. It’s the catalyst for countless utterances of “you can’t take the ghetto out of them”. In short, it’s a delicate situation that requires proper context and a tempered delivery. Which is never the job for Peter Vecsey. Just to be clear, I am not at all implying that Vescey is a racist, asserting that this was much ado about race or claiming that anyone else directly involved in this situation-particularly David Stern-had any racial motivations. That would be naïve and irresponsible of me. As it would be of you to state that race had absolutely nothing to do with how this story broke and was immediately perceived. I don’t look to Peter Vescey for anything more than the occasionally entertaining misanthropy and I don’t look to the New York Post for anything other than sensationalistic drivel. So when the Washington Post-a far more reputable outfit and one that provides daily coverage of the team in question-presented an alternative scenario, I found it entirely believable. Not because I wanted to, but because it was something I would expect from Gilbert Arenas. A joke. Albeit an inappropriate joke that obviously crossed the line, but a joke nonetheless. Me? I laughed. I found his attempts to disarm a tense situation quite entertaining. But I understand how Javaris Crittendon could see it as a threat or an indication the he wasn’t being taken seriously, which is apparently what happened. Those who are owed substantial amounts of money and perceivably threatened with firearms don’t like jokes. 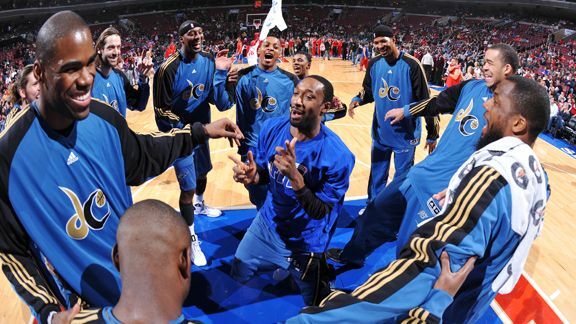 Gilbert Arenas has been suspended indefinitely and without pay, which is practically always the precursor to a season long suspension and in this case, perhaps a voided contract. Of course it wasn’t all due to two ill timed thumbs and pointer fingers, but they were the final straw. A reasonable question could be raised why. If it was because Gil refused to show contrition and needed a harsh lesson to understand the impact of his actions, then that is justifiable. But knowing David Stern as we do, it’s equally plausible that he felt mocked or that Arenas’ lack of contrition meant Stern had no control which would entice mocking. Some of the cognoscenti and twitterati have implied that the finger guns that shocked the world were aimed directly at Stern and apparently he took it as such. Which I find as troubling as Vecsey’s…. Well that certainly changes things. Back to square one, in fact. Even if only half the initial story was correct. An unprecedented act of one teammate pulling a gun on another in their own locker room.